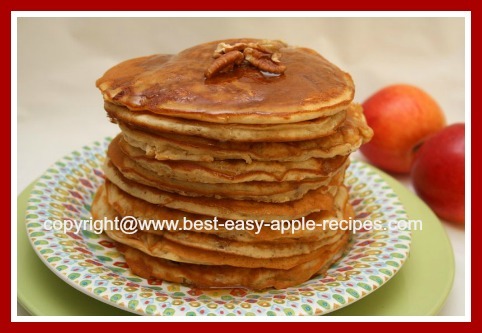 Looking for the VERY BEST Apple Pancake Recipe? 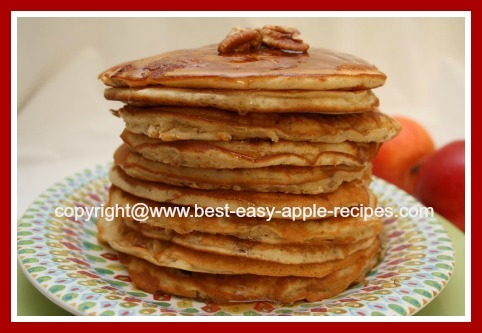 It's this Apple Pecan Pancake Recipe that is so delicious everyone will want second servings for breakfast or brunch! 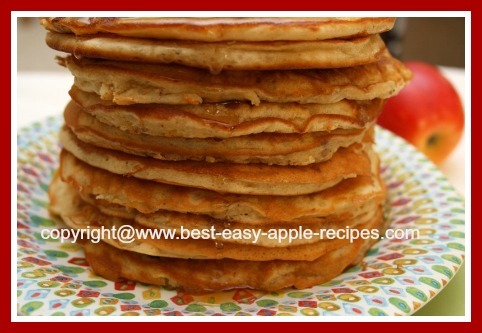 I made these pancakes yesterday and they were oh so good! 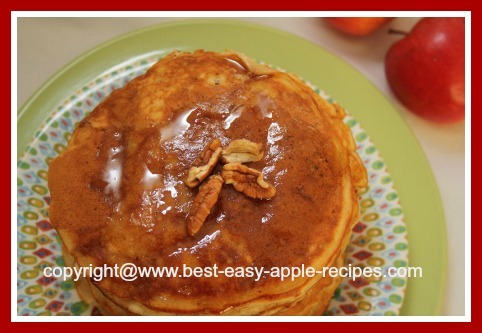 Yummy Homemade Apple Pancakes with Pecans! I made a batch and one-half of these pancakes, and froze the extra pancakes. Freeze them between pieces of waxed paper and them in an air-tight container. When ready to use, simply microwave the pancake(s) and ... they are ready to enjoy! In a large bowl, whisk together the flour, sugar, baking powder, baking soda, cinnamon and the salt. 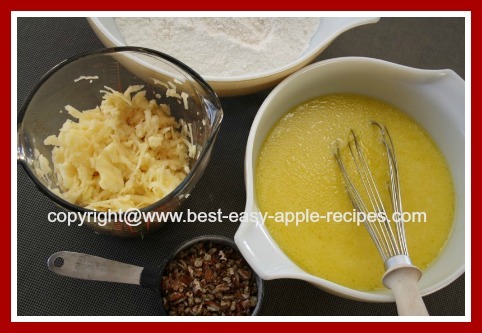 In another bowl whisk together the eggs, milk and oil until blended. 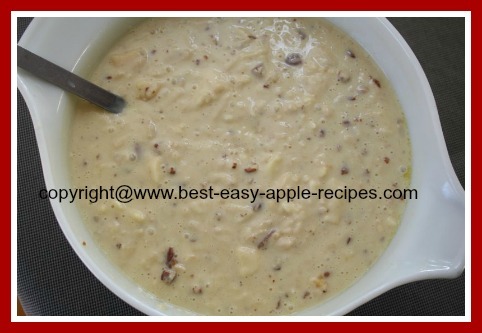 Add the egg mixture to the flour mixture and stir just until moistened, do not over-mix. 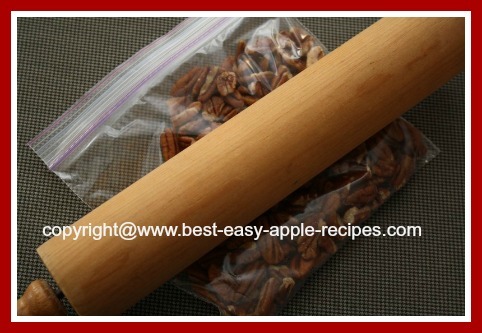 Stir in the shredded apple and the chopped pecans. 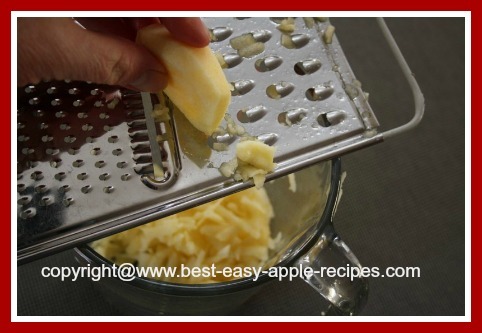 Lightly grease the griddle or frying pan (I use shortening). Heat griddle or pan to medium-low heat. Using a ladle, or a measuring cup, scoop about 1/4 cup of batter onto griddle (or make large pancakes if desired). Cook until the bubbles on the top of the pancake begins to pop and bottoms are golden brown in colour, then turn over, and cook until the second side is golden brown in colour. If the batter is too thick, simply add a little more milk, until the desired consistency is reached. I keep the oven heated on low (200° F) and pop the pancakes in as they are done, so that they all stay warm, and the family can be served the scrumptious pancakes all at once. Serve plain or serve with a side of mini sausage sizzlers ... Mmmm! Top the pancakes with maple syrup or a fruit sauce of your choice. ENJOY!